You may remember that I wrote about my Rapid-Response Marketing Kit -- the 2 stamped thank-you notes I carry with me everywhere, so I can thank prospects and clients at a moment's notice. Mailing thank-you notes has been a secret weapon of mine for years. They work like a force multiplier, making any sales pitch by phone or email at least twice as effective, in my experience. Turns out, I'm not alone. Gaye says: "I keep it on the front seat of my car. If I’m early to a meeting, waiting for an appointment, or want to write a quick note after a meeting while the energy is fresh, I pull out a note card and make a connection with someone, rather than checking my emails." Why do I put so much stock in mailing thank-you notes? And how can they work like secret weapons? 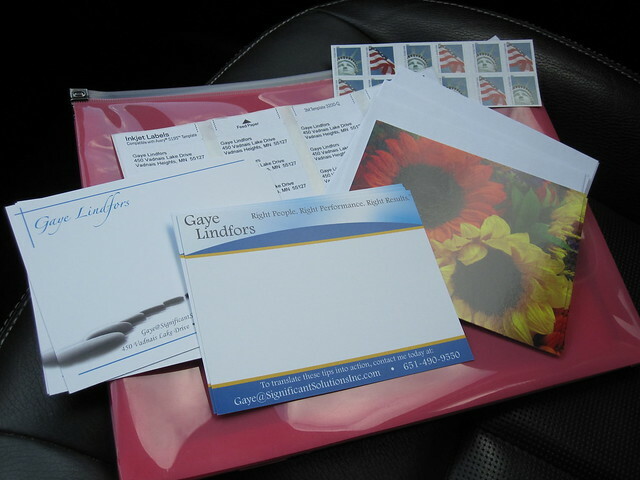 As marketing author Harry Beckwith writes: "Handwritten thank-you notes feel like gifts because you took the time to find the paper and envelope, write the note, affix the stamp, and gift-wrap your note in its package." A handwritten thank-you note is a heartfelt gift. And gifts are good. They separate you from the hordes of impersonal competitors who are chasing the same prospects as you. Whatever you mail to prospects (to get them as clients) and clients (to keep them as clients), mailing a "thank you" is better than emailing ... nor sending nothing. Tom Peters said: "The calendar never lies. You can claim something is your priority, but if your calendar doesn't reflect it, you're lying to yourself." Here's my corollary: QuickBooks never lies. You can claim something is making you money, but if your QuickBooks reports don't reflect it, you're lying to yourself. Implication? Stop lying to yourself. Find out what's really making you money. 1) What's working really well? What 1-3 marketing methods are producing the bulk of your new clients? What 1-3 clients (or client types) are producing the bulk of your profits? What 1-3 products or services are producing the bulk of your profits? 2) What's working unexpectedly well? What 1-3 marketing methods are delivering more sales, more easily or profitably than expected? What 1-3 clients (or client types) are easier and more profitable to serve than expected? What 1-3 products or services are easier and more profitable to sell/produce/deliver than expected? And this question is potentially more valuable than question 1) -- it helped me uncover a $54/month revenue stream that exploded into $54,000 a month. If you're like most business owners, you won't take the time to answer these two questions. Look around. Most business owners are struggling. What does that tell you? More importantly, why not take a hard look at your numbers to see what they tell you? After you meet with a prospect who wants a price quote from you, how do you respond? Do you send a project summary (never a "quote," "proposal" or other commodity language!) within 24 hours? If so, you probably send that information by email, right? Well, here's a way to quickly and easily close more sales: Mail a thank-you note RIGHT AWAY, even before sending any marketing literature by email. 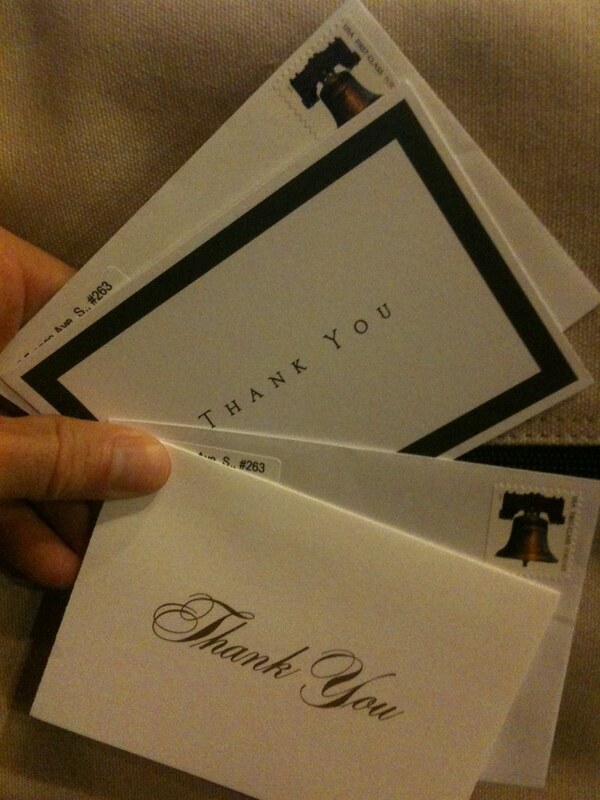 Thank-you notes in the mail have been my secret weapon for years. They work like a force multiplier, making any sales pitch by phone or email doubly effective (in my experience). But ... mailing a thank-you note to prospects is easier said than done. You're busy. You may forget. And who has time to look for a stamp? That's why I always carry not one but two thank-you notes in my satchel, ready to address and mail at a moment's notice. The photo above was taken "in the field" at Caribou Coffee, where I met a prospect. I call this my Rapid-Response Marketing Kit. My accountant calls it money in the bank. You can call it whatever you want -- but do give it a try.